A few years ago I set out to find the ultimate brownie recipe. I tried many recipes. It was fun research. 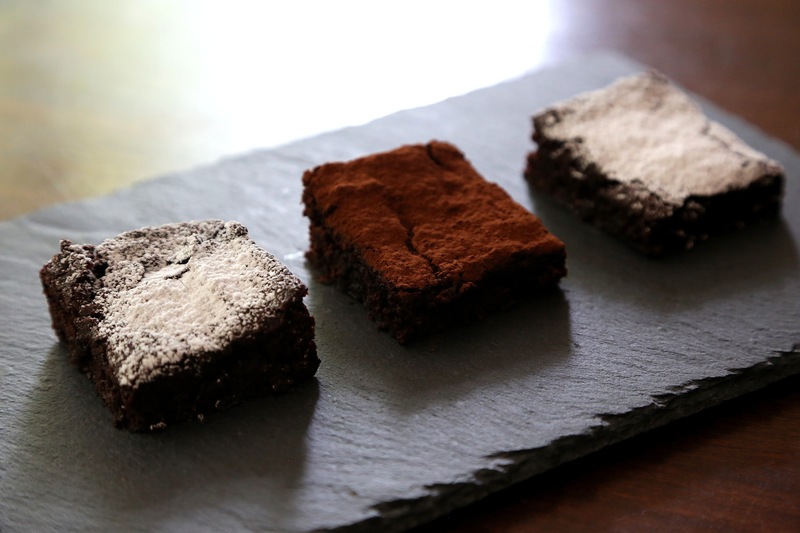 I liked this recipe the best as it has everything I want in a brownie – rich, dense, fudge-like and an intense chocolate flavour. The fact that it is really easy to make is just a bonus. The original recipe is by Alice Medrich, the First Lady of Chocolate. I am yet to buy one of her books but I think I must as I keep reading about Medrich’s wonderful desserts on so many other blogs. I have used this recipe many times and it’s always a winner. If you prefer more fudge-like consistency then I recommend that you use dark brown sugar; use granulated white sugar if you prefer a more cake-like texture. But the most important tip for great brownies is to not overcook them! In the spirit of experimentation, and in consideration of my arteries, I made a batch where I substituted the butter and eggs for plant-based alternatives. It didn’t quite have the same mellowness as the brownies based on butter but the difference was very subtle. I do find it quite reassuring to know that I can still make a batch of irresistible brownies even if I don’t have any butter or eggs in the fridge. I have listed both recipes below so you can choose for yourself which you prefer. How do you like your brownies? Do you add nuts or other ingredients? Preheat oven to 160C (325F). Line the bottom and sides of a 20 x 20cm (8 x 8 inch) baking tin with baking paper. Leave an overhang of baking paper as it makes it easier to remove the cooked brownies from the tin. Melt the butter in a saucepan. Remove from the heat, add the sugar and stir until the sugar has dissolved. Add the cocoa and thoroughly stir until the cocoa is completely mixed in and there aren’t any lumps. Add the salt, vanilla and eggs and mix. Add the flour and gently fold through until only just combined; be careful to not over mix. Now is the time to add any extra chocolate/nuts/fruit and gently stir in. Pour the mix into the tin and bake for about 25-30 minutes. It’s best to let the brownies cool before cutting. Dust with a little icing sugar or cocoa before serving. I think they are better the day after baking. Place the vegetable oil, sugar and applesauce in a large bowl and stir until the sugar has dissolved. Add the cocoa and thoroughly stir until the cocoa is completely mixed in and there aren’t any lumps. Add the salt, vanilla and vinegar and mix. Sift together the baking powder and flour then add it to the mix and gently fold through until only just combined; be careful to not over mix. Now is the time to add any extra chocolate/nuts/fruit and gently stir in. Pour the mix into the tin and bake for about 25-30 minutes. 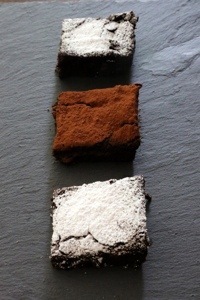 Posted in Bars, Brownies & SlicesTagged Alice Medrich, brownie, chocolate, cocoa, food, food photography, Smitten Kitchen, vegan, vegetarianBookmark the permalink. I hope you try it. I would love to know how it goes! wow- these look so beautiful. I will definitely try them. I’ve never made brownies with cocoa powder though, I’ve always used chocolate. Do you think this makes much of a difference? Thank you! Apparently using cocoa instead of chocolate does make a difference to the texture. Cocoa butter is harder at room temperature than butter. So a brownie made with chocolate will have a higher cocoa butter content and will be firmer. A lot of people say these are the best brownies around. I have a fallback recipe I always use that includes chocolate but these do look deliciously dark and fudgy. I’ll have to give them a try! I hope you try this recipe; they’re delicious! Oh my! That looks sinfully decadent! I can eat a plateful of them with a big glass of milk. 🙂 Delicious! Thank you Anne! They were very delicious. Brownies are one my favourite recipes and it’s so difficult to find the perfect recipe as there’s so many! Thanks for sharing these great recipes! I love brownies too. There are so many recipes out there it’s hard to know where to start. I was happy to do the hard research for you!